We have just released the latest video in the health series that we have created for Dr. Marco Ferrucci of The Chiropractic Source in West Caldwell NJ. Dr. Marco who is in practice with his partner Dr. Tim Lyons have been using video to market their Chiropractic practice. One of the suggestions that we give all of our clients is to find a special interest website where they can share their video content. Dr. Marco found Natural News TV and has created a channel for all of his videos. 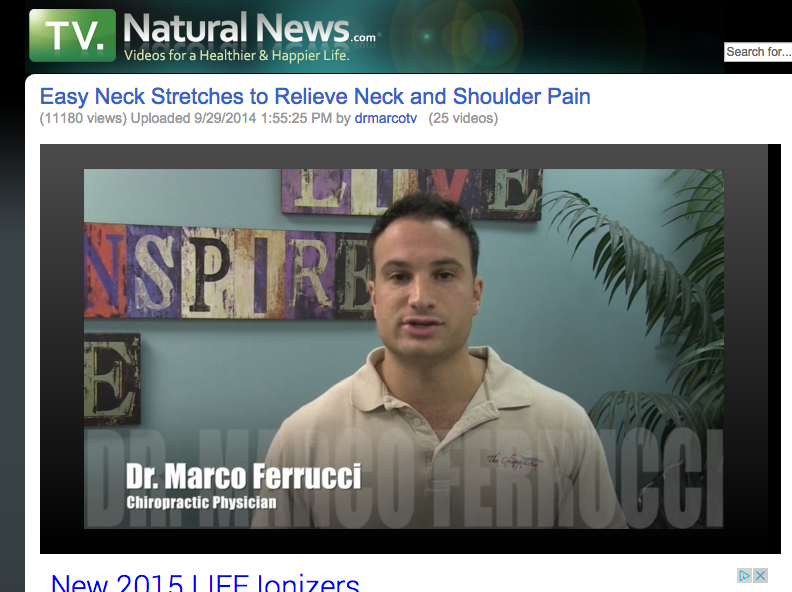 Each time we release a new video on the Chiropractic Source YouTube Channel he also releases it on Natural News TV. As you can see in just a couple of days he has had over 11,000 views of the video. One of Dr. Marco’s videos has had over 50,000 views. In fact if you do a search for “Easy Neck Stretches” on Google the post appears on the first page of results. The power of online video is undeniable. With Youtube being the second biggest search engine on the internet every business needs to have original video content in their marketing mix. Check out the video below.